Quotes – Physics says what? Einstein once expressed his exasperation at Bohr’s position on quantum weirdness to the young physicist Abraham Pais. “I recall,” Pais wrote, “that during one walk Einstein suddenly stopped, turned to me and asked whether I really believed that the moon exists only when I look at it.” With an understanding of decoherence, we have an answer to Einstein’s question. Yes, it is there when no one observes it—because the environment is already, and without cease, “measuring” it. All of the photons of sunlight that bounce off the moon are agents of decoherence, and are more than adequate to fix its position in space and give it a sharp outline. The universe is always looking. Yeah, I’m finding it more and more interesting when physicists indicate their own puzzlement and wonder. 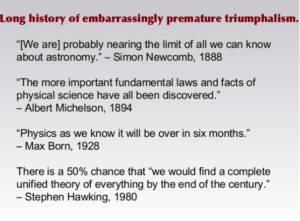 Also, the blunders in the history of science. “But in fact intellectual progress usually occurs through sheer abandonment of questions together with both of the alternatives they assume — an abandonment that results from their decreasing vitality and a change of urgent interest. We do not solve them: we get over them.” — John Dewey, The Influence of Darwin on Philosophy, p.19. — Richard Feynman, Richard P. Feynman (1985). QED: The Strange Theory of Light and Matter. Princeton University Press. p. 129. ISBN 0-691-08388-6. [2-18-2014] Well, then I noticed the series “Beyond the Wormhole” on TV. I mostly watched episodes in the evening when I was tired and / or distracted. Recently, after watching Episode 6 of Season 2 for the third time, I connected with the piece about physicist Yves Couder and his vibrating tray of silicone oil and spooky silicon droplet. Intriguing. Just what Lord Kelvin might want to satisfy his need for a mechanical model, eh.